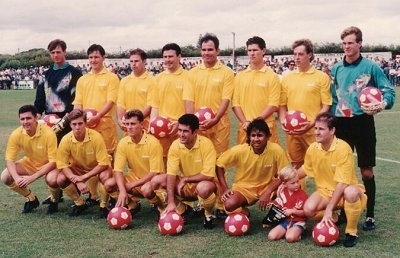 Wearing yellow shirts and black shorts, IFC (International Football Club) Perth Kangaroos competed in the Singapore Professional Soccer League, during the 1994 season, taking out the title without loss. Pre-season favourites, their run-away success paved the way for a Perth side to enter the N.S.L. in their own country after years of being ignored by the Australian Soccer Federation. The Kangaroos were controlled by Global Football Australia, a consortium consisting of Joe Claudio (Chairman), Frank Schaper (Managing Director), Trevor Crewe (Director), Jim Davis (Director) and Tom MacKay (Director). Having been snubbed once again by the national body, the West went in search of first class competition and found it in the S-League, a ten team competition that also featured fellow-Australians the Darwins Cubs. It was hoped at the time that this formula, whereby clubs from different nations would compete for a common championship, would lead to a wider South-East Asian competition. With estimates of a projected audience of over 3 billion, thanks to live television broadcasts of the S-League in Asia, the potential for expansion into Asia was enormous for West Australian, and Australian, soccer. As it became clear that the competition would be a walk-over for the Kangaroos, home attendances plummeted from over 5000 to as little as 500. Crowds in Singapore were also poor as the premier South-East Asian competition at the time was the Malaysian League where the cream of the Singapore League were playing for the Singapore Lions. In an effort to increase gates, the Kangaroos switched their home matches from Macedonia Park mid-May to night fixtures for the remainder of the season at Dorrien Gardens. Financial losses caused by falling attendances only added to the clubs woes which saw its on-field achievements often over-shadowed by the off-field problems which dogged the club from the start of the campaign. The Kangaroos had difficulties securing players before the season began, only a last-minute agreement between the Professional Soccer Federation board and the W.A. State League, which the saw the S-League side lease a maximum of three players from each State League club for the duration of the season, saved the club the embarrassment of not fielding a team in the tournament. Even so, they had to call off a practice match against Singaporean side Selangor at the Kiev Sports Ground at half-time when a lack of players forced the Kangaroos out of the game. 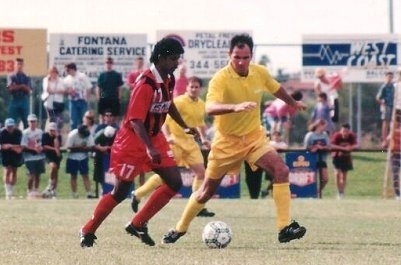 An hour before the scheduled kick-off time, Perth Italia issued writs which effectively refused to let the Kangaroos use five of their players - Vince Matassa, Gareth and Craig Naven, Dale Wingell and Paul Strudwick - who had been training with the Kangaroos without renewing their club contracts, making them ineligible for the S-League team. An inquiry into the fiasco was called by the W.A. Sports Minister and the matter was cleared up within the week, the Kangaroos agreeing to use only contracted players. Wingell and Strudwick left Italia within weeks in order to make themselves available for the Singapore competition. In fact, none of those who turned out for the team for their opening S-League match against Gilbraltar Cresent had signed any sort of contract with Global Football Australia at that stage. The players had decided to seek legal advice concerning the contracts they were offered pre-season in order to secure a better deal. In the last week of April, a combination of events prompted speculation amongst the local soccer scene that all was not well at the fledgling club. Joe Claudio resigned from his position of Chairman to commit himself to his legal career, and only days later the Kangaroos had to postpone their home fixture against Balestier United when that club were unable to find a suitable flight to Perth. The following week the problems at the club were made public when Global Football Australia declared themselves bankrupt, management of the Kangaroos being handed over to the Soccer Association of W.A. The threat of not being able to complete the season was averted when Arena Investments came to the rescue with a $50,000 package, part of which was that the players would see out the season with no financial benefits. As the season began to tail-off, and it became obvious the Kangaroos would take out the S-League, the club came into heavy fire from State League clubs when they refused players the right to appear for both the Kangaroos and their State League club on the same weekend. Many of the players believed they were capable of playing twice in two days, and some proved this correct when they put in credible efforts for both sides having been granted special permission to play locally. This refusal on the Kangaroos behalf led to two problems for the S-League side. Firstly, a number of the Kangaroos squad opted to turn out for their State League clubs, where they would get renumeration for playing. And secondly, State League clubs began making their players unavailable for the Kangaroos as the local competition was reaching make-or-break point for some clubs. This further depleted the Kangaroos squad, so much so that coach Gary Marocchi and his assistant Mickey Brennan were called upon to play in the final weeks of the season. The players that turned out for the team during the season were Vince Matassa, Michael Petkovic, Vladimir Beretovac, Sean Lynch, Alex Cummings, Craig Naven, Marc Wingell, Joe Marrapodi, Stephen Willey, Gareth Naven, Scott Miller, Steve Bourne, Ray Marinovic, Paul Dymock, Vince Tana, Paul McVittie, Dale Wingell, Jason Van Rooy, Taki Nicholaidis, Gary Lees and Paul Strudwick. The 'non-playing' staff was made up of coach Gary Marocchi, assistant coach Mickey Brennan and club physio Barry Tate. Captained initially by Craig Naven, and later by his brother Gareth, the Kangaroos were never challenged in their quest for the championship which they clinched three rounds before the season was over. Strudwick topped the S-League scorers chart with 16 goals and was rewarded by being selected for the S-League select XI, while Lees came in a close second on the scorers charts bagging 15. Gareth Naven took out the "West Australian" Player of the Year Award polling 40 votes, 15 clear of Scott Miller and Vladimir Beretovac on 25. Next up were Paul Strudwick (24), Steve Bourne (19) and Gary Lees (18). In a revealing article written for the "West Australian" (26/07/94) newspaper titled "Kangaroos are big loser off the field", Mel Moffat questioned the future of the club whose original committment was for three years in the S-League. He put the full cost of the venture in the vicinity of $100 000 once all things had been taken into consideration, although the true cost was never publicly released. Requiring home gates of around 3 000 to remain solvent, the club started off well but the fans fell away rapidly with home gates for the second half of the season averaging just 600. Moffat notes that the Football Association of Singapore went back on their original deal with the Perth Kangaroos by removing their best players for the Singapore Lions, who were pulling crowds around 50,000 in the Malaysian League. Roger Lefort, then executive director of the Soccer Administration of W.A., has gone on record to say that this was the killer blow to the league which was severely weakened and relegated to second-class status within its own country. And the failure to attract major sponsorship for the team cost them considerably. Moffat calculated that on a weekly salary of $400 per match, the players lost over $60,000 by playing 12 matches for nothing once G.F.A. left the scene. Coaching staff were estimated to add a further $10 000 to this bill. A players fund, set up to raise money for those who took to the field, raised $20,000 (part of which was Strudwick's $2,500 for being the leagues leading scorer) which was split amongst the squad at the completion of the season. Arena Investments are said to have been out of pocket by around $20,000 once they'd paid for the teams travel and accomodation expenses, despite having collected the (Singapore) $70,000 prize-money which came with the trophy. Despite the huge financial loss, Gary Marocchi believed the venture was worthwhile, "With next year's move to the N.S.L. in mind, it was a good experience for our players to take part in an international competition." He went on to say that he supported the club taking part in the S-League the following season in order to benefit the players who would make up Perth's new National Soccer League side. The club was laid to rest at a meeting of W.A. soccer officials late in August when it was decided that the state would focus it's attention on getting a team in the Australian domestic competition. Note : Games marked with an asterix (*) were friendlies. All others are S-League matches. Mar 3 Selangor* (Malaysia) (H) 1-4 ?? Apr 19 Perth Italia* (A) 3-2 ?? Jun 11 Tyrwitt (H) ?-? ?? Jul 8 Olyroos* (N) 0-2 .